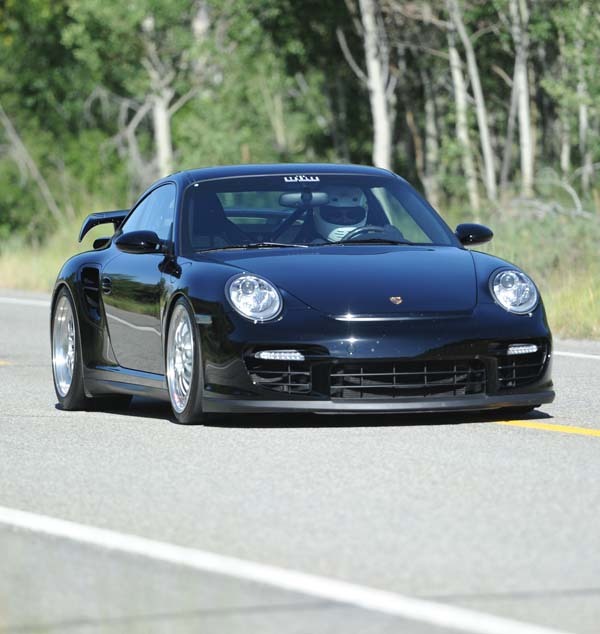 Twin Falls driver Bob Shillington set a new Sun Valley Road Rally speed record on Saturday, pushing his black 2008 Porsche GT2 to 198.4 mph on a 3.2-mile stretch of state Highway 75 north of Ketchum. Shillington, driving the same Porsche, was also last year's winner with a top speed and another course record of 197 mph. Shillington's winning run was one of 60 runs made by drivers in mostly recent-model Porsches, Ford GTs, Mustangs, Ferraris and other high-speed vehicles in the fourth annual road rally, the major funding source for the Blaine County Community Drug Coalition. The other top winner was Boise resident Doug Jensen, who spent $100 on a raffle ticket that won him a 2012 Porsche Cayenne valued at $48,200. Saturday's Road Rally was preceded Friday evening by the Ketchum Cruise Parade, in which about 60 rally drivers and owners of classic vehicles got to show off their machines on the streets of Ketchum. The Saturday rally was followed by a gala dinner at River Run Lodge where the Porsche Cayenne drawing took place. Coalition Executive Director Terry Basolo said Monday that gross proceeds from the event won't be known until later in the week but that he expects this year's amount to exceed by 10 percent last year's gross earnings of about $250,000. Costs, including that of the Porsche Cayenne, need to be deducted from that. Basolo said from 500-600 spectators paid to attend the rally event from the spectator area south of the Cathedral Pines area. He further noted that about 1,100 of the 1,500 Porsche raffle tickets were sold, that all 60 runs for the rally itself were purchased, that the gala dinner sold out and that there was good participation in the Ketchum Cruise Parade. "It was a great weekend, about 10 percent better than last year," Basolo said. Dave Stone, one of the rally founders and the owner of Sun Valley Auto Club, one of the event sponsors, said rally proceeds "far exceeded our expectations." Stone noted that Shillington's winning time may not have been his best run in the Porsche. He said Shillington likely exceeded 200 mph in a second run but that the speed tracking device malfunctioned so the run couldn't be counted. Blaine County Sheriff Gene Ramsey, whose agency was also an event sponsor, said there were no major problems with the event. "We're getting better at it after four years," Ramsey said. The sheriff noted that there were a few complaints about traffic delays for the race, but said this year's new format of opening the highway back up about every 20 minutes kept traffic from stacking up too much. "No matter what though, you're always going to get some complaints," Ramsey said.